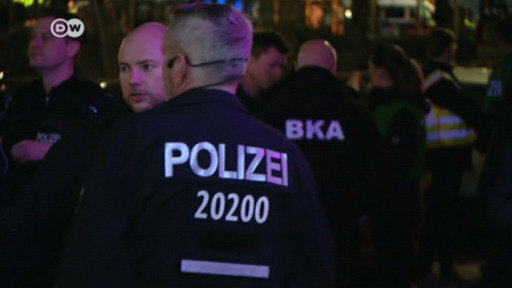 The younger brother of one of Berlin's most notorious mafia bosses has been arrested in Denmark on suspicion of plotting to kidnap the children of German-Tunisian rapper and former business partner Bushido. A spokesman for the Berlin state prosecutor has confirmed earlier press reports that Yasser Abou-Chaker was taken into custody on Monday night, and that German authorities were seeking his extradition. His elder brother and clan boss Arafat Abou-Chaker is already in custody in the German capital, having been arrested last week at the end of an unrelated trial for assault, at which he received a 10-month suspended sentence for breaking a janitor's nose — it was Arafat Abou-Chaker's first-ever conviction in 33 court cases. Arafat Abou-Chaker was, however, immediately arrested again in the courtroom, under the direction of state prosecutor Petra Leister, for "conspiring to kidnap minors, inciting others to kidnap minors, and to cause serious bodily harm." Investigators say the brothers had been actively looking for people ready to carry out the kidnapping. The mass-circulation Bild newspaper reported that the Berlin police had been tipped off by the surprise testimony of another family member: an unnamed female cousin living under witness protection in Denmark. The woman, a cousin of 42-year-old Arafat and wife of 37-year-old Yasser, told investigators that the two brothers were planning an acid attack on Bushido's wife and to kidnap his children. This was apparently to be an act of revenge after Bushido cut ties with the Abou-Chakers in March 2018. Bushido is currently under police protection. Another rapper, 24-year-old Capital Bra who was signed to Bushido's label, this week angrily accused his boss of working "intensively" with the police and left the label. "Now he's ratting people out, and those people are going to prison. I don't believe in that. The police are your team now!" Capital Bra said in a video posted to Instagram on Tuesday, announcing his break from Bushido's label Ersguterjunge ("He's a good boy"). While there was no indication any of the arrests were tied to statements Bushido may have made to police, the accusations were may have been enough to drive the rapper to increase his personal security. Bild reported that Bushido found protection from a rival Berlin family, led by Ashraf Rammo. Rammo's protection service is, according to insiders, likely to be costing the rapper and label owner a large percentage of his income, and could carry its own risks, should the Abou-Chakers and the Rammos ever reconcile. The 40-year-old Bushido, one of Germany's most successful rappers and a celebrity for over a decade, was once Arafat Abou-Chaker's business partner and for many years faced accusations that he was "owned" by the mafia boss. Various media reports suggested Bushido, whose given name is Anis Mohamed Youssef Ferchichi,had to pay Arafat Abou-Chaker protection money in exchange for managing his career and driving rival rappers out of Berlin. Bushido regularly dismissed such allegations but admitted that he and Arafat Abou-Chaker were close friends and that they ran property businesses together. In a 2012 interview with the daily Frankfurter Allgemeine Zeitung, he said,"We're best friends. In fact, it goes beyond the status of friendship. It's not that I got involved with certain people, but we became what we were today. It wasn't about getting advantages." But in 2018, he released a track interpreted to be all about Arafat, entitled Mephisto. Bushido also briefly harbored ambitions of founding a political party and running for the Berlin state parliament, and he even completed an internship in the Bundestag office of Christian Democrat politician Christian von Stetten in 2012. In his FAZ interview, he called for the abolition of the euro. His lyrics have often been accused of expressing far-right extremism, misogyny, homophobia, anti-Semitism, and anti-Americanism.